I decided today to join the ranks of many others out here in the east coast in eagerly recounting my own harrowing tales of the natural disasters of the past week. I would like to pause and recognize anyone reading this from the west coast, where tremors like what rocked us are a common occurrence, or the southern coast, where hurricanes are a seasonal truth. Yes, you are superior and may judge for our extreme response. But it is our response all the same. We didn’t vent the dryer properly and now it has blown up the basement and the house is caving in. The men doing construction behind our house backed into the foundation and are shaking the house. At this point, my head knew what to do: find a doorframe to stand in. But did I do that? No. My first response, because it seemed natural, try to run outside. But I couldn’t get the door open so I instead resorted to jumping up and down in the living room shrieking. I think that my extreme movement during the earth’s shifting might have heightened my sensation that EVERYTHING WAS FALLING APART! Later, I finally got ahold of James who had been evacuated with all the rest of the congressional staff and not allowed to re-enter. Apparently ground shaking in this city instantly means terrorism to most people. I have much to learn. We didn’t have any damage, just some fallen things to pick up. 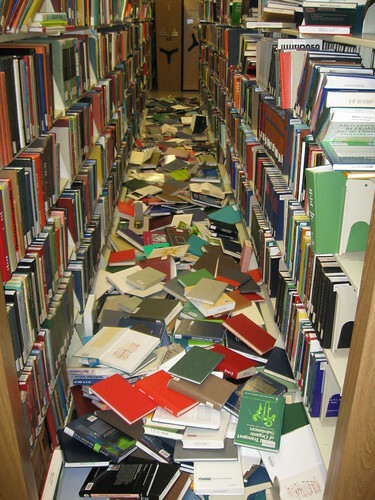 However, when I toured University of Maryland’s library today I learned that about 30,000 books fell to the floors during the shaking and several whole sliding shelves toppled. 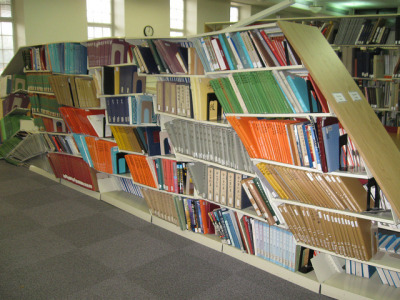 Here are some pictures from the library’s flickr. After recovering from the earthquake, we were then met with Hurricane Irene. For this, my housemates and I were prepared, though I can’t take much credit. I finally filled up my gas tank at James’ insistence, but other than that my preparations consisted of baking pie and feeling deeply thankful that if we did lose power for several days, I had at least mastered Big Southern Hair sans electricity. The storm was due to hit in the evening, and when I went out for a run late morning the city was eerily quiet. I suppose the reminder of nature’s force via the earthquake had left everyone taking heed of the media. Liz (one of my housemates) is a journalist, and spent the day responding to my texts asking for weather updates. James and I had planned on going to Fairfax that night to have dinner with friends but as the evening went on the rain and wind did seem to indicate that driving through a hurricane for some tortilla soup and board games might be ill advised. But it was so gloomy, and tortilla soup eaten with dear friends so appealing, that we finally decided to take the metro out. Our rational was that if the metro was running, it was probably safe to be doing so. Few other people thought like us and we enjoyed a private, quiet, wind buffeted ride out to Fairfax. We made it back safely, although James was appalled when he stepped off the metro into an empty station sometime after midnight and there was a pair of underwear lying alone in silent tribute to the chaos of Irene. We ended up not losing power, for which I am thankful, though it means that my tales of surviving two natural disasters are far less glamorous than they might have been. Still, their anticlimactic ending is what now allows my to sit safely in my undamaged house and write blithely of my past week. And for that, I am thankful. This entry was posted in Uncategorized and tagged DC. Bookmark the permalink.